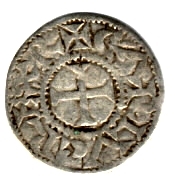 I invite you to take a guided tour of my collection of medieval French coins. Along the way you will see over twenty examples of coins that are anywhere from 600 to 1000 years old. The tour should take less than 10 minutes, depending upon the speed at which you read the short descriptions. I've arranged it so that the images for the next page will load into your computer's cache before you actually get there. (How did I do that?) This speeds up the tour, but will only work if you go through the pages in order. Just follow the links marked "Continue the tour - " and you'll be in good shape. 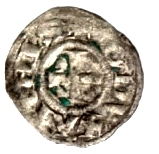 I've also marked the first coin of each section with a number to give you an idea where you are in the tour. Continue the tour - We'll begin with a little History lesson . . . I'd appreciate hearing your thoughts on my collection.